The number of permanent deacons for the Archdiocese of Philadelphia increased by 21 on Saturday, June 6, through the ordination ceremony and Mass celebrated by Archbishop Charles Chaput at the Cathedral Basilica of SS. Peter and Paul. This newest class of permanent deacons was unique in several respects. It is the second largest class since the permanent diaconate was instituted in the archdiocese in 1981. It was almost evenly balanced between city and suburban candidates, countering recent years when almost all deacons were coming from and assigned to their suburban parishes. The class was also more ethnically diverse, with six deacons who received their formation in a separate Spanish-language program and were ordained for badly needed service in heavily Hispanic parishes. There was also greater diversity this year in the lay occupations of the newly ordained, including doctors, lawyers, teachers, but also a retired paratrooper, a grave digger and a pizza maker. In his homily, Archbishop Chaput pointed to a recent book by New York Times columnist David Brooks, “The Road to Character.” In it Brooks spoke of two types of virtues, resume virtues and eulogy virtues. The first one people might utilize when seeking employment, the other what people would wish others to say about them when they die. Resume virtues could include how much education we have, how energetic we have been, what our employment history was and how clever we are at making money. Eulogy virtues could include kindness, forgiveness, bravery and honesty. “Most of us say the eulogy virtues are the most important, but most of the time we act like the resume virtues are most important,” the archbishop observed, as he challenged his new deacons to model themselves after the selflessness of Jesus, as shown in the Gospels. Nineteen of the new deacons are married men, which was reflected by the huge number of extended family members present for ordination. The unity of the order of deacons was also represented by the large number of already ordained permanent deacons who attended. Permanent deacons at this time undergo a seven-year process, including an initial year of aspirancy before their formal training begins, If the candidates are married their wives, who must give consent, are included in the formation program. Commenting after the ceremony, Deacon Gerard McPhillips conceded he was nervous but excited. “It was a long haul, but my wife made as much of a sacrifice as I did and said it was well worth it,” he said. In all, the 19 married deacons have a total of 58 children, and Deacon John Mischler and his wife, Sherry, account for three of them. As for their children, they were absolutely supportive. 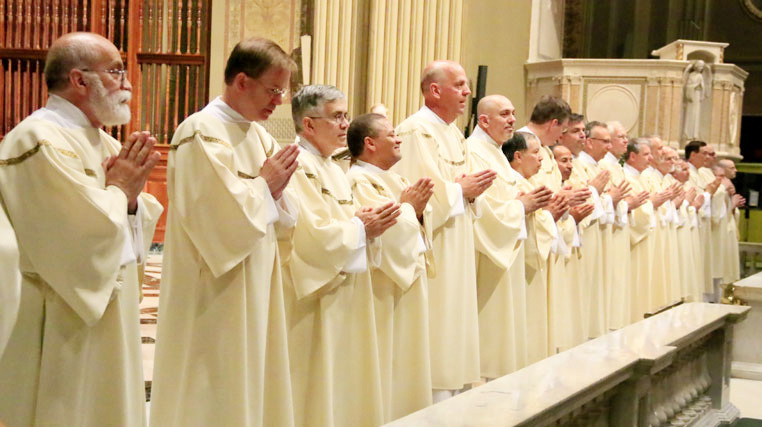 The 21 men ordained for the permanent diaconate for the Archdiocese of Philadelphia this year contrasts to the seven men ordained for the priesthood, and four men ordained as transitional deacons that are scheduled to be ordained priests next year. Almost 300 deacons now serve in the archdiocese. The contrast underscored the need for permanent deacons to assist in parishes because of a growing shortage of priests. However, there will be no ordination of permanent deacons next year for a technical reason — the training programs for permanent deacons was increased by a year and that has left a gap, according to Deacon Michael Pascarella Jr., who is the Associate to the Vicar for Clergy for Permanent Deacons. He estimated at this time there are about 75 men in formation for future years if they persevere. Those in formation also represent a nice ethnic mix as well as city-suburban mix, according to Deacon Pascarella. One difference from this year is that all will attend the same classes even though there are some Hispanics among the 75. At the close of the ordination Mass, Archbishop Chaput assigned all of the newly ordained deacons to service in their home parish. See the full list of assignments. See more biographical profiles of each deacon. I went to the Chester County Library to get the book by David Brooks. They did not have the book; I am going to try Amazon. I was happy to hear about the Spanish Deacons. I try to give the Spanish people in our parish Spanish religious material. It is much easier for them to read in their native language. Love & prayers Paul I am going to read this book.